Alpine Tents for Sale, Alpine Tents are absolutely arresting to look at. 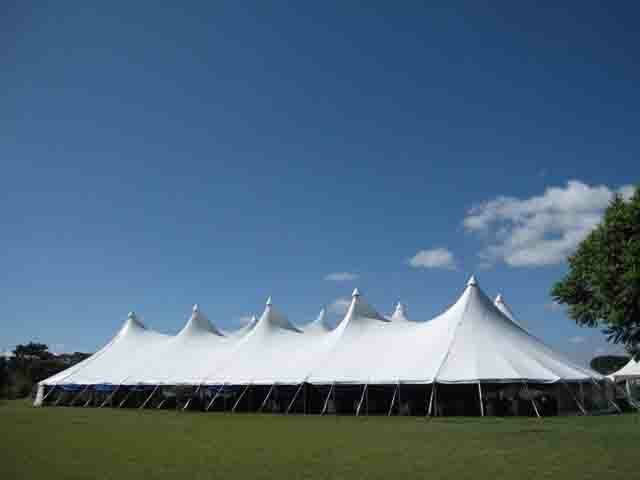 The numerous high peaks of a pristine white Alpine Tent looks glamorous and very upmarket for any event. The high peaks are aerodynamically designed and make the tent feel much more spacious due to their height. The airflow in the tent is much better than in other tents because of the Alpine Tent’s special design. In fact, an Alpine tent can be left standing semi-permanently because it is so stable. 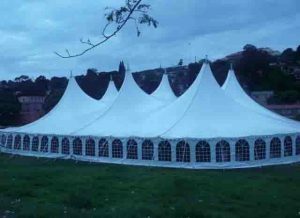 These tents are actually perfect for large functions, formal sit-down functions, weddings, parties, festivals and fairs. Alpine tents have been used for a circus or other performances, festivals, large weddings, religious tent revival events or more recently corporate entertainment events. They are also very popular among the tent hiring industry. Traditionally made of canvas, modern “party tents” are now made of PVC. Alpine marquees are held down with tensioned ratchets and/or stakes. The peaks are designed for optimal stability and aerodynamics and can withstand any atmospheric condition, greatly minimizing any movement of the roof. 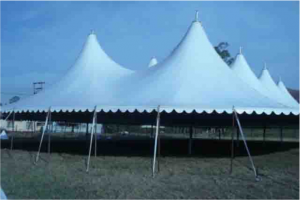 All our tents can be ordered according to customer specifications. Alpine Marquees Seater Plan: 20m x 20m (800 seater); 20m x 30m (1800 seater); 20m x 50m (2000 seater); 30m x 50m (3000 seater) Our Alpine Marquees Tents are available in 20m, 25m, 30m, 40m up to 100m widths in any length continuous in 3.0m bays This series is suitable for many any occasions. Combining the best of old and new, our traditional-style alpine tents have all the classic elegance of old-fashioned pole marquees along with the benefits of modern technology. These tents have the beautiful swooping lines of the classic marquee, ideal for romantic traditional weddings, formal garden parties or any event where period style or a little extra elegance is called for. Supporting poles inside the marquee which can be decorated with ribbons, flowers etc. 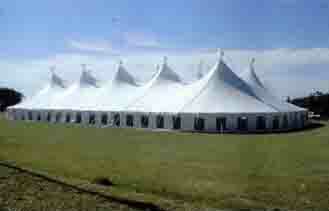 Erected with guy ropes and pegs, but unlike older marquees, they do not need huge amounts of space. Thanks to modern technology. Fabric made from flame-retardant PVC manufactured to the latest international standard. Alpine Tents is the perfect solution for any business in need of a functional, flexible, and temporary storage building. Tents for Sale offers a top of the line Alpine Tent designed and produced in South Africa with a strong, durable aluminium frame and a heavy duty, fire retardant cover PVC. The cover is fire retardant and certified. A functional, economic attractive alternative to permanent structures with an intelligent construction for quick assembly. The Alpine Tent can be used all year round and can be disassembled and moved if necessary. 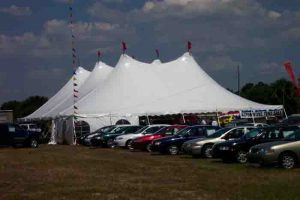 Tents for Sale is market leaders in alpine tents for sale in south africa, design and supply of Clearspan Alpine Tents Structures. Alpine Tents are available in Clear span Widths of 5m–60m and eave heights from 3m – 6.2m in structures of unlimited length. It creates the ideal venue for any kind of event. Alpine Tents is versatile and lightweight, yet highly durable which provides the user both quick installation and dismantling times. 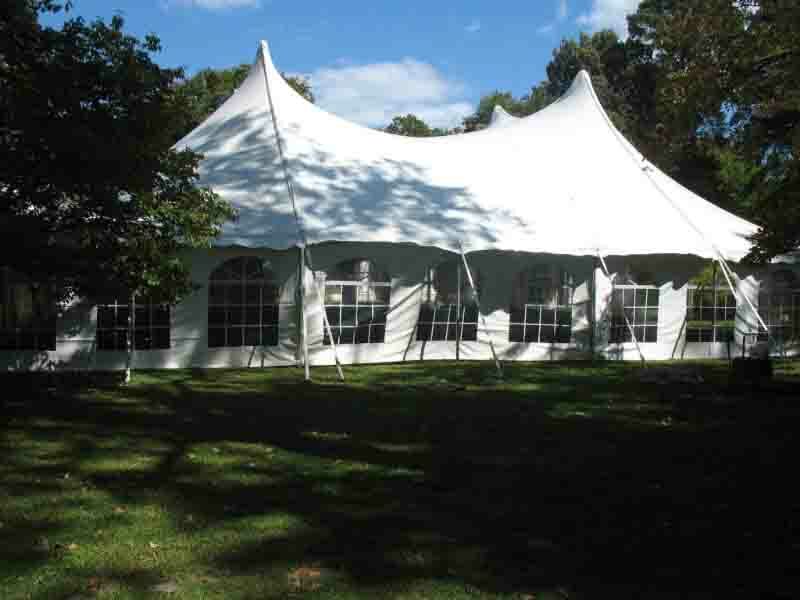 We are committed in providing excellent quality tents at very competitive prices. Alpine Tents for Sale. Alpine Tents could be widely used for temporary outdoor Exhibitions, Wedding Parties, Festival Celebrations, Conferences, Sports and other events. No pole inside means 100 percent interior space is used. Alpine Tents has a full line of accessories available such as, windows sidewalls or plain PVC sidewalls are up to customers. Alpine Tents constructs beautiful venues using high quality marquees, ranging from wedding receptions and garden parties to summer balls and corporate events, we have a range of clear span marquees and accessories to create the perfect event. Our Alpine Tents are made from rigid aluminium or steel frames clad in white or clear span PVC. Our tents are made by advanced technology. Our Alpine Tents range from 20m x 20m through to 20m x 60m and we also can custom make any size to your specific requirements. Length can be extended by 5m. Custom made tents are welcome. Alpine Tents can be beautifully branded with any logo you require.